Knowledge Bomb 1: A couple days ago, I released my top 25 catcher rankings to kick off my positional rankings. Let’s continue our way around the diamond and head over to the ultra-deep first base. On the offensive side of things, first base is hands down the deepest position with several superstars and plenty of talent to go around. The best way to utilize the depth is to also grab your corner infielder (in leagues that use the spot) from this pool. Some feel that the depth at first base allows you to wait on the position altogether, but I don’t think that is the right play at all. I think you should be ready to double and perhaps triple dip (1B, CI, DH) into the plentiful bounty of first base. 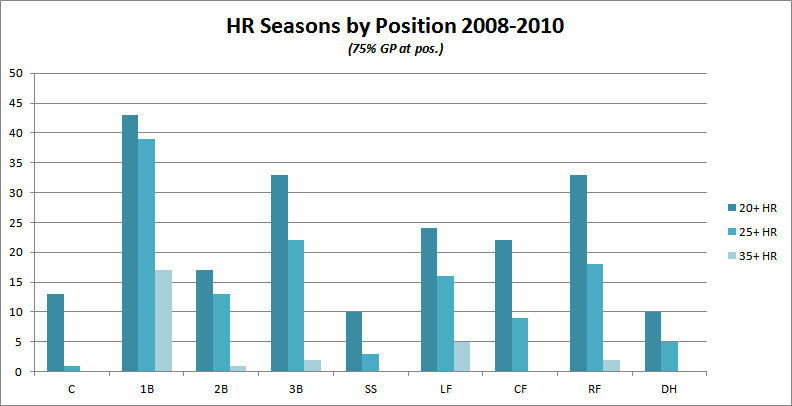 There are other strategies to be employed, but my feeling is that with the excess of power potential at the position compared with the dwindling power supplies in the league at large, why not maximize the position and its four-category contribution: power (HR, RBI, R and AVG as each HR contributes a hit, too)? Overvalued: Ryan Howard – this one is relative as I still think he is plenty valuable as a major power source, but I’m not sure he returns to his truly elite power self as some of the warning signs are to be taken seriously. He’s been going off the board as the 5th or 6th first baseman in a lot of industry mock drafts that I have seen and his ADP (average draft position) is 6th and 7th at Mock Draft Central and Couch Managers, respectively. I’ve got him 9th, so it’s not a huge dip, but I wouldn’t make him down for 40-140 automatically in 2011. Undervalued: None – no one being seriously overlooked, at least not by more than a slot or two which isn’t enough to get up in arms. There is some value at the position because the depth pushes some guys down, but no one is being criminally passed over in lieu of lesser options. Target: Kendry Morales – Yes, he is coming off of the big leg injury, but that isn’t something that will sap his power or hamper him at all this year. He had a breakout 2009 and was in the midst of an excellent follow-up in 2010 when the accident happened, I expect him to pick up right where he left off and continue as one of the best first basemen in the league. Even if you already locked up an elite first baseman in the first or second round, there would be nothing wrong with coming back in the fifth round and slotting Morales’ 30-home run power into your corner infield spot. Best of the Rest: Adam Lind – he doesn’t yet qualify at first base in standard league formats, but as his assumed position for Opening Day, your league may allow you to draft him there. Even if that isn’t the case, he will earn his eligibility there quickly and he has elite power potential with the ability to hit .275+ yet he is going behind LaRoche and Pena (who he is a rich man’s version of) according to current ADP numbers. If he were first base eligible right now, I would slot him between Konerko and Butler. Rookie to Watch: Freddie Freeman – He strikes me as James Loney-esque right now lacking enough power to be a starting first baseman. He could be a .280 hitter with mid-teens power, though, which is still worth rostering even in mixed leagues given the late round cost attached. He’s really the only rookie 1B with a chance to start in 2011. Few leagues use each outfield position individually, but even if I had lumped all three together the point of first base’s power prowess would have still held. You need three to five outfielders in all leagues whereas you need just one first baseman (but could feasibly roster up to three with corner and DH). First base is the only elite power source on the diamond. If you leave your draft or auction with Billy Butler (who I really like, so don’t get me wrong there) as your starting first baseman, you have messed up and you will likely be struggling for power all year long. I will reiterate that you needn’t take a first baseman in the first or even the second round to cash in on the power surplus. So if you wanted to go shortstop and third baseman to attack some of the scarcity around the infield, that would be a feasible strategy and you would still have plenty of power first basemen available to you in the third and fourth rounds. However, if you’re looking at a blank 1B spot on your roster in the back end of the fifth round, chances are you are well behind your leaguemates at the position.